The rope machine is the center piece of the set of equipment necessary to make rope or cordage. This page discusses "the rest of the story" that beginning rope makers or museum groups will need to consider when fitting out a rope making capability. Naturally, the rope machine is the major item. It should be stored out of the weather when not in use. How are you going to mount the rope machine to something sturdy? Clamps or bolts are preferable for quick attachment to, or removal from, the mounting base. Machines such as the Bucklin, McIntosh, Sherwood Wizard, and Woodman can clamp direct to an inch thick fence or wagon board. A special stand can be build to provide the fence board "on edge". Machines such as the New Era, Wonder, and Economy need to be screwed to a carrier board that can then be clamped to a table, column, or special saw horse type stand. The machines are made of cast iron and must be protected from collisions where something strikes it while attached to the mounting stand. More of these machine have been broken in handling accidents than during making rope. The carrier board and machine need to fit within the carrier tote discussed below. Machines such as the Meyer have a mounting base built within, and can be bolted or clamped direct to a mounting surface or stand. The adjacent figure shows the Meyer in profile, with two carriage bolts penetrating the base. One hole, say half inch diameter, is drilled in front of the machine head, while the second one is drilled toward the back of the baseplate. Both holes are on the center line of the baseplate. Corresponding holes are drilled into the mounting surface. Carriage bolts of 5/16 or 3/8" will fit into these holes. Hand tightened wingnuts are sufficient to secure the bolts and machine to the mounting surface. Traveler Device- the traveler is the hook at the other end of the rope lay up from the rope machine. Various items can be used, from a hand held rope tool, to a rope and pulley traveler, to a hook and swivel attached to a sled. These have parts that get lost if not stored with the rope machine. The rope and pulley needs a stand or post or wall to mount the pulley. Then you need ballast to tie onto the rope, such as 3 to 5 pound sand bags. Adjust ballast based on the length of the rope being made. More loose parts! Actually, a tripod, with legs 4.5 feet long, makes a good stand. It becomes another "stand" to be maintained with the rope gear, but allows you to work anywhere, versus being dependant on provided facilities. The sled idea comes from using any sled or cart that has consistent friction with the ground or floor, requiring a constant amount of force to pull it along. Mount a swivel and hook to the vehicle for attaching the lay up. The attachment point should be about the same height as the center of the rope machine. 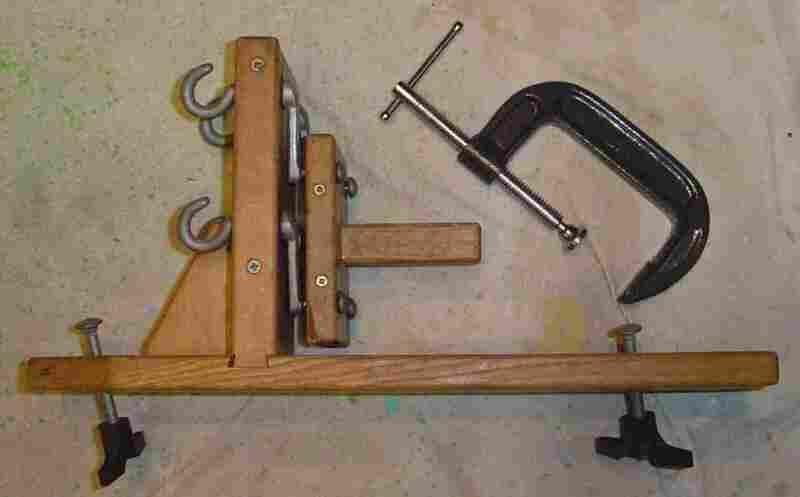 Additional Rope Tools - Have additional rope tools on hand for making rope. Nothing worse than having a tool break while being used. It does happen. Plan to have spare tools at hand. Maintain a variety of tool sizes, consistent with your rope making intentions. The tools can range from rather small for scale cordage, to several inches across for making inch-plus thick ropes. As you move from three strand ropemaking to four or six strand rope making, additional tools for those configurations will be necessary. Tape Measure - Need one to lay out the lay up length, and to measure length of completed rope. For cutting the rope yarn, twine, or rope, consider a hand held anvil cutter. 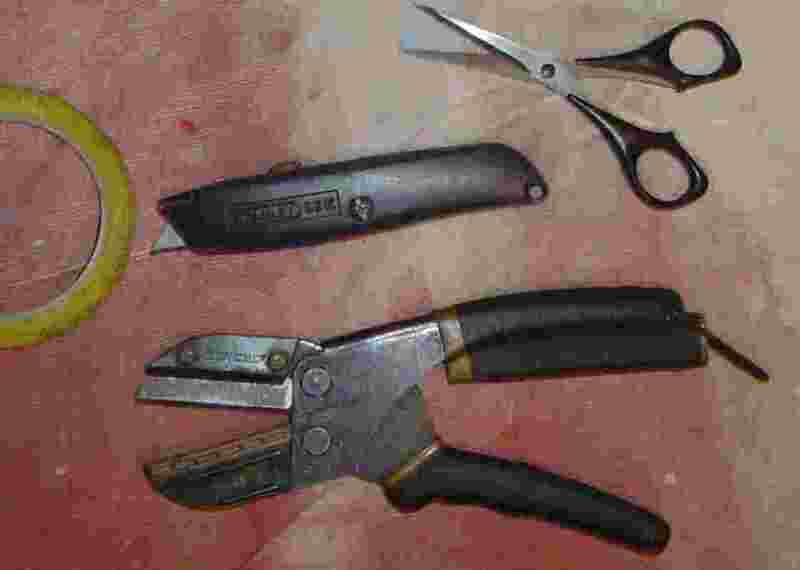 The tool looks similar to a limb trimmer, in that one side of the cutting jaw is an anvil, while the other is a steel cutting blade. This tool is very effective and much safer than a pocket knife. The blade and anvil set will outlast many other cutters, including utility razor knives. The utility razor knife does come in handy later on to trim strands when splicing or knot tying. Get one with a retractable blade. Avoid the ones with spring loaded retracting blade. The anvil cutter tool can cut half inch diameter rope for about the same effort as cutting baler twine. For both of these cutters, buy replacement blades versus resharpening the old blades. Less cuts in your skin this way. The scissors come in handy trimming whipping material or strands when splicing. Whipping material is necessary to seal the ends of the rope before removing it from the rope machine. 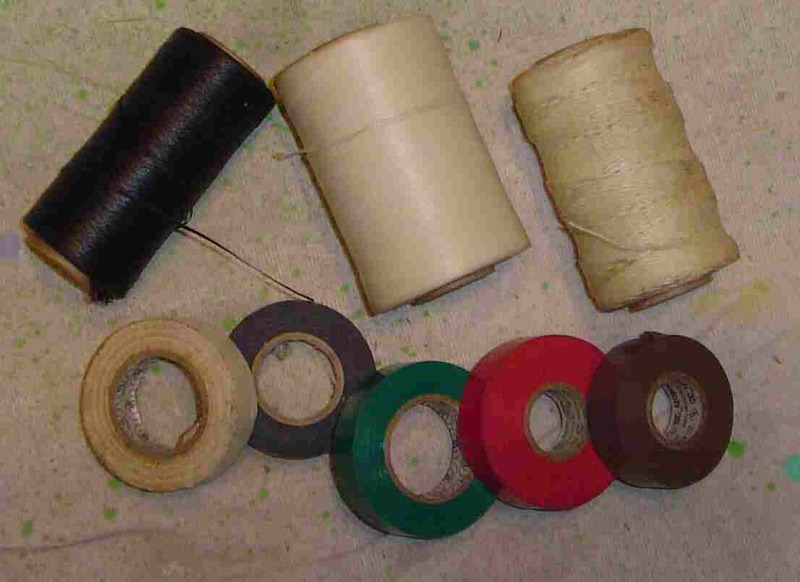 Vinyl electrical tape is an inexpensive, readily available material that works with all rope materials. This is a must-have for synthetic rope materials. It comes in at least 10 colors besides black. Vinyl electrical tape is made by various companies in various grades. The better grades work better than the cheaper, or discount, equivalents. You get what you pay for. Shown in the picture is waxed lacing cord, which is effective for vegetable fiber rope (hemp, sisal, cotton, manila, etc), it slides off polypropylene, nylon, and other slick synthetic materials. Get the waxed or rubberized coating. Available colors are black or white. Get the polyester based lacing cord at commercial electronic supply outlets. Avoid the noncoated lacing cord versions. The "old" standby lacing cord was waxed linen, which now is quite expensive. The polyester works much better.